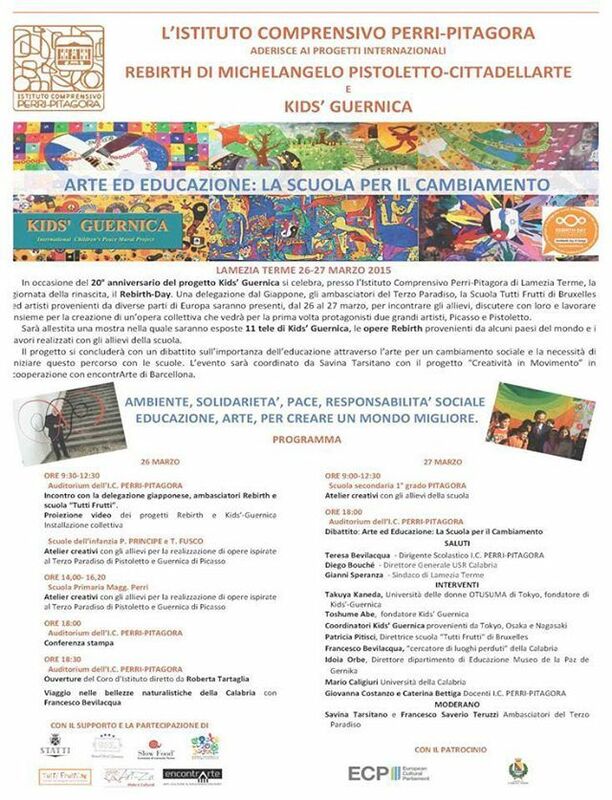 Arte e Educazione: La Scuola per il Cambiamento Organized for the School “Istiuto Comprensivo Perri- Pitagora”, with the project, creativity of movement from Savina Tarsitano and the cooperation with Espronceda. peace in the world being inspired by the work of Pablo Picasso, and of the artistic rebirth/tercer Paraiso project from the Italian artist Michealngelo Pistoletto and Cittadellarte. as well as the language school Bruxelles Tutti Frutti, to discuss about the importance of the topics like the social responsibility, the atmosphere, piece, the solidarity the cooperation and others. Furthermore an exposition of the fabric of the Kids-Guernica from all over the world has been organized. And performances of all students from the schools with a participation of 1600 students. Take a look at these videos and click the links to have more information!